Plot – The worlds in danger and the only way to save it is for Transformer loving Cade Yeager (Wahlberg) to help our friendly robots unlock a hidden mystery that goes right back to the medieval ages of King Arthur. Most avid cinemagoers have a guilty pleasure franchise, perhaps a dark secret they hide from other film fans in fear of imminent judgement. It could be the Fast and the Furious franchise, Underworld or help us all the Resident Evil series. Personally for me over recent years, tapping into the inner boy that still lives large inside me, my guilty pleasure franchise has been the Transformers series. I’m certainly not going to argue with anyone about the cinematic qualities of Michael Bay’s explosion ridden collection of what some people would call crimes against cinema, but I’ve found much simplistic joy watching humungous robots go toe to toe on a scale that only Bay knows how to do and no matter what his many downfalls as a filmmaker are, there’s not many directors out there that do large scale spectacle as impressively as Bay frequently conjures up. In saying this, I was quietly hoping that The Last Knight, Bay’s 5th film in the Transformers series, would provide some good dumb fun but it’s with some form of geeky, inner boy sadness that I report this series has officially lost its robotic shine in one of the years dumbest, most obnoxious and overall bland big screen experiences. Everything that made this series fun in the first place, from its highly popular and better than many would want to admit first entry through to increasingly dwindling later entries is unfortunately lost in The Last Knight. Bay seems bored behind camera with the films few and far between set pieces barely rising the pulse, his cast seem downright unhappy to be a part of the film from Mark Wahlberg’s returning Cade Yeager through to Anthony (“dudeeeee”) Hopkins cringe-worthy support as Sir Edmund Burton and you know things are getting dire when even the robot fisticuffs or Bumblebee’s presence isn’t enough to make a Transformers film entertaining. It’s a shame that the series has lost sight of what made it popular in the first place and while Transformers fans of old may enjoy an overly complicated story that touches on series and plotlines of old, for the rest of us, this bizarrely long and exhaustive experience will create headaches rather than smiles as we try to figure out what on earth is even going on. Talking to much about the plot line of a Transformers film would be an act in stupidity but Bay and his 3 screenwriters have truly outdone themselves in creating a Razzie worthy story that includes King Arthur, a drunken Merlin, Nazi’s, orphaned children who just keep showing up in inappropriate situations, robotic dinosaur babies and an organ playing transforming butler who at one stage quite literally gets called out on screen as a C-3PO rip-off (which is exactly what he is). There’s more that’s going on in the films plotlines and detours but one thing that can be surmised without hesitation is that this confusing and convoluted story is working hard to pick up the slack of a lack of heart and excitement factor, in a film that fails to justify its existence in this years crowded summer blockbuster market. As is to be expected from this franchise, the robots and CGI work look fantastic, the explosions nice and explosioney (just the way Bay likes it) and Mark Wahlberg’s arms are a sight to behold but The Last Knight feels like a sad death knell to a franchise that at one stage provided what we require from a summer blockbuster; A silly yet simple storyline, a cast of fun characters and some eye-popping visual spectacle that covers up many of the films various downfalls. That The Last Knight fails in all of these aspects is a tell-tale sign that you should avoid this series worst entry like the robotic plague. “humungous robots go toe to toe on a scale that only Bay knows how to do”. Hmm. De Toro did it better in Pac Rim. Could spark an interesting debate that one mate! I am a fan of Pacific Rim for the fun it provided that is for sure. As guilty pleasures go, I liked Pac Rim a lot. Only Transformers that came close was the first, IMO. But then again, I swore off after Dork of Moon, and haven’t watched 3 and 4. The Last Knight’s story, while somewhat intriguing with the whole Arthurian lore, was so disjointed and unnecessarily convoluted. It felt like two movies in one. Plus, too many characters to follow (both human and Transformers). Yeh I think mate that there could’ve actually been a really decent and fun movie from the basic plot line but as it stands, its just messy and totally boring. not going to see that one. Nice review. Yeh mate avoid at all costs, and that’s coming from someone that enjoyed the other entries. As if I needed any more justification not to see this thing. Thanks for the review, guys. Well-said, as always! Ha mate save that money for something else, that is for sure. I was the same Movie. Even though it was far from amazing it was fun and a masterpiece compared to this one. For me, this film was far better than the last few Transformers movies but still not great. It felt like five ideas thrown into one movie. I actually think there’s a good movie in there somewhere. I do agree with there’s a good movie in there somewhere. I heard they had about 12 writers come in and hatch out a story so I think that’s why there are so many different elements going on. They should’ve just focussed on one or 2 things. It feels so hashed together. Yeah it’s definitely poorly stitched together. Great review by the way! Felt a little sad writing it as it was a series I really had enjoyed up to now. I can understand that. Nothing worse than reviewing a movie you really wanted to enjoy but were left disappointed. What are your feelings on the changes in the aspect ratio? It completely ruined the action for me. The humour as well, I couldn’t get around any of the jokes. 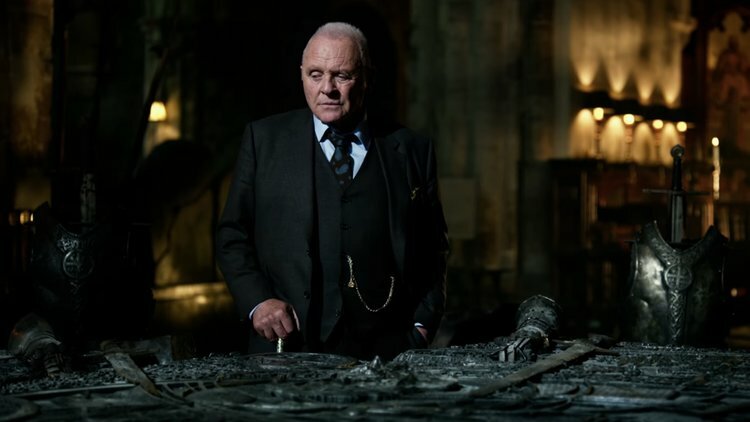 What the hell was Anthony Hopkins doing in this movie? That being said great review guys. Yeh the ratio stuff was really annoying! As for Hopkins lets just say the pay must of been good ha.